Certainly not the final bodywork but there are some hints of the new direction for aero this season. Gone are the blown diffusers you can imagine there will be a lot of work profiling sidepods so as to gain some of the lost downforce. Most definitively the front wing will not look like that. 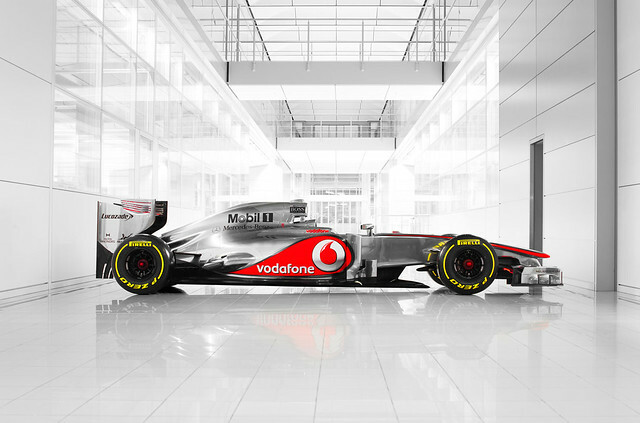 The MP4-27, at first glance, looks "normal", nothing obviously revolutionary. Certainly the chrome paint jobs at Woking get better and better, car looks amazing. Watching the launch, you are struck by Jenson Button's leadership role, he's been there two years and looks the boss and his name is on the launch car..
Hamilton by contrast seemed a bit shy and tentative despite having literally grown up there but he was quite funny though, cracking on Massa and later Schumacher. His own bodywork has undergone some evolution with a wider version of the famous chinstrap now morphed into pro to Emmo mutton chops. Better aero, I'm sure.